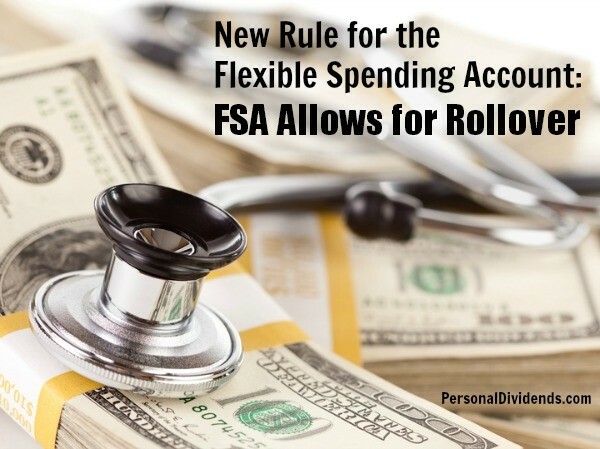 One of the most frustrating aspects of the Flexible Spending Account (FSA) is that, since its inception, the funds have been use it or lose it. You decide how much to set aside at the beginning of each year, and if you don’t use up all of the funds in your account by the end of the year, you lose what you don’t spend. That’s all about to change — at least for some workers. A Flexible Spending Account is a special tax-advantaged health care account offered by some employers. If you have a FSA, a certain amount of your paycheck is deducted, before taxes, and put into an account. You can contribute up to $2,500 a year. Since the money is deducted before taxes, it means a tax advantage right now, lowering your income and your tax liability. The money in the FSA can be used for qualified health care purchases that aren’t covered by your insurance plan. This includes co-pays, as well as other out-of-pocket expenses. The main drawback to the FSA has always been that you have to use all the money in your account each year, or lose it. That is changing with a new rule being implemented by the Treasury Department. This news is welcome to those who have a hard time gauging what, exactly, they will spend on health care throughout the year. There is no way to predict how much is needed. As a result, some workers have reluctant to participate. Then they find themselves paying for out-of-pocket costs with after tax dollars — which are less efficient. There is a savings when you can pay some of your costs with after-tax dollars, and more workers might be willing to take advantage of it if they know that they can roll some of the excess to the next year. Of course, there are some limitations to the new rule. The limitation is that the $500 rollover can’t be offered with the grace period that some companies offer. Some companies provide a grace period of up to two and a half months. This is already built into the law right now, and provides workers extra time to spend their accumulated health care funds. If your company doesn’t offer the grace period, it makes sense to find out if your employer will provide you with the $500 rollover option. Either way, the idea is to help you get through your funds a little faster. If you have a FSA and you realize that you still have money right now, it’s a good idea to start thinking about some of the things you and your family might need, and spend on those items. Great article, as usual. I’d like to make a suggestion to congress – Kill the FSA. Really. You mentioned the HSA, the more beautiful/handsome, and richer sibling of the FSA. With a higher limit and no lose-it provision, it’s ideal. Only, it’s not available unless you have a high-deductible heath plan. Let’s lobby congress to simplify. Kill the FSA, and remove the constrictions on the HSA. My former neighbor a few towns over said “Simplify.” I hope congress will listen, finally.